I learned Final Cut Pro X and Motion 5 since it’s been released mid 2011. It seemed a really promising app.1 I think I learned the tools well. Maybe you’ll recall my post from last year where I said "Final Cut Pro X is not a pro-sumer application. Now that I worked with it, I can tell you it’s not. It’s actually one of the best video editing apps I’ve ever used. Watch this presentation to get enlightened why this generation of editing software is just another transition. A couple of changes in my work environment now make it necessary to move forward, and I don’t see any other way than to take the leap and start using FCPX in my production environment. Three months ago I started the production for my Hazel tutorial. After the recording was finished, I had to decide whether to stay with Final Cut 7 or use Final Cut Pro X. It was no easy decision. I knew the day would come, but it came quicker than I anticipated. This is not going to be a post about how I think Final Cut Pro X is a professional tool and whom it’s for. This is going to be a written down version of the things I’ve learned along the way. Things that are really great, things that make my life easier and things that make it harder. Maybe other screencasters will profit from my experience. I work on recordings of computer screens. Mainly recordings from iOS and OS X devices. We do a first rough edit in ScreenFlow. The final editing is done in Final Cut. I spend most of my time in Motion though. Motion is a 2D (and 3D) animation application. It’s no less “mighty” as After Effects, the industry leader. Motion has less bloat and, as we will see, the integration with Final Cut Pro X is just damn awesome. Motion is so important because it allows me to manipulate the recorded screens. I have all the images from the operating system (buttons, sliders, menus, etc.) saved as graphics. When a client wants me to change something in a screencast, I can just do that in Motion without re-recording (and editing) everything again from the beginning. I can manipulate whatever we have at the moment. Motion is also the tool that allows me to make an app “look good”. If the flow the user has to go through while using an app, is longer or more complicated, then we can’t show that in an ad. The app has to shine. So I just go ahead and make it look natural. Think of it like “retouching for apps”. I can basically rebuild an app without any code. Everything is possible. Programmers might choose, say, a view transition, that is easy to do with CoreAnimation. I don’t know what’s easy to do in code, so I don’t have that creative border. If it feels right to have certain UI elements fly around and rearrange to accommodate for changes in the app, then I can change that easily. Eventually though, I always end up in Final Cut, it’s where I put all the pieces together. Did you know that the MindNode “brainstorming” screencast has five layers? That’s a lot of layers for a screencast. A usual Mac OS X Screencasts screencast has about one, maybe two. There’s the main recording, the titlebar with WIFI symbol and clock is another one4, the touch animations are another layer, then a text layer, and finally one layer for edits to “correct” mistakes made in the recording. TL;DR: I spend most of my day in Final Cut and Motion. Here’s what I learned. One only publishes the color of a rectangle and its color picker will be available in Final Cut. Every new instance of that template (or rectangle) can have a different color. A popup menu that allows to pick different graphics for callouts. A hand, an arrow, a hat. A menu that allows to pick different build-in and build-out times for a title. Pick colors for multiple objects at once. Offset colors for multiple objects. Rigging and Publishing are the two best features in Motion 5. As screencaster this is pure gold. A motion graphics dream. It is absolutely phenomenal to publish a template so that my editor can just pick it up. To give a brief overview of what Rigging can do, watch this video by Fox Mahoney and checkout Callouts by Ripple Training. All the plugins that now get built for Final Cut…I can hardly keep up testing them. Remember the “magnetic timeline” that was supposed to make things easy? It does make things easy! It’s not easy to work with at first though. All those clips that “automagically” move around. It’s weird. I had a feeling of losing control. When I got used to it though, it became natural. I learned how Final Cut does its things and the automatic moving is most of the times just great. The two handles on the top right and left allow to move the out and in-point of the clips. Keyboard shortcuts makes this easy to work with. Just place the playhead on either side and nudge with , or . for a frame-precise edit or ⌥, and ⌥. for 10 frames precision. The other two handles determine the length of the transition. This alone is so much faster compared to the “old way of doing things”. One can move pretty quickly through a project using JKL, or the ↑ and ↓ buttons (which move the playhead one edit forward or backward). Once the playhead is on an edit, [ and ] can be used to select the in or out point of the adjacent two clips. Nudging works as described in the previous paragraph. Again there’s nothing to worry about. Everything just moves as needed. Just make sure every clip is connected to the correct clip in the Main Storyline. Hold down ⌥⌘ while clicking on the clip in the Main Storyline and the connected clip changes its connecting handle. Sometimes it’s necessary to work “non-magnetically”. What I mean by that is that one sometimes need to edit a clip, but keep the clips in the Main Storyline where they are. In those cases where clips can’t move around automatically, “Lift from Main Storyline” ⌥⌘↑ comes into play. Once the edit is made, simply overwrite the Main Storyline by pressing the opposite keyboard shortcut ⌥⌘↓. Beware: If you’ve changed the clip length, the underlying clips will be affected by this! Longer clips will get shortened by the lifted clips and a shorter clip will leave parts of the gap clip in the Main Storyline. The “Final Cut Pro 7”-way of creating a freeze frame is also gone. The current frame can be exported from the Share menu and imported back in, though that should only be used it when the “Final Cut Pro X”-way doesn’t work. The FCPX-way is ⇧h. 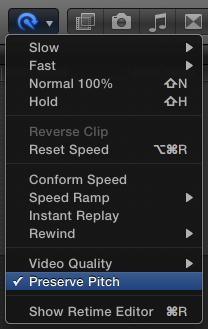 This inserts a 2-second long, 0% speed part of the clip — a freeze frame — that can be lengthened and shortened using the left and right handles in the Retime Editor (⌘r). Unfortunately the rest of the clip now also has “speed” applied to it, which means the clip sounds “manipulated” on playback. In those cases select the clips that play at 100% and deselect “Preserve Pitch” from the Retime menu. Though this solves the problem in most cases, I found that sometimes the audio slows down like a turntable that loses its power. An easy way to work around this is by creating a second clip that has its speed changed to 0%. Cut/blade (⌘b) the clip in the Main Storyline, lift, adjust the length either via Retima Editor or by selecting the clip and hitting ⌃d (which shows the clips’ duration in the dashboard in the center), then drag the clip back into the Main Storyline. All other clips will rearrange as needed. As there can’t only be praises for Final Cut Pro X, there have to be some complaints as well. Because it is so preferable to have these Motion projects directly in the project, there is the problem that one needs to archive these with the project when the project is done. This causes a lot of trouble since in Final Cut Pro X. Thew new Final Cut searches the installed templates when a project is opened. If there’s no matching template, it can’t be used within a project. In Final Cut 7 Motion files were saved independently. To backup and archive a project [Motion Template Tool] can be used. I solved archiving by having a separate disk image that has basically three folders. I produce a lot of video for the web. On the web, space is precious. I have to produce videos in frame sizes that are far off what you expect from a DVD or the cinema. The videos are much smaller, or they need to scale to various sizes. Therefore being able to set the frame size is a necessity. Without it I can literally not do my work. I mean that in the literal literal way. Final Cut Pro X can’t do that. There’s no way. Apple has not provided a way to set an arbitrary frame size for a project. There is however, a way to turn any Compound Clip into a “mini project” that works and acts like a project, but doesn’t live in the Project Library. Compound Clips live in the Event Library. This app allows to build installers and archives of custom Motion template files. It is developed by Andreas Kiel. Although this app is essential, it is important for me to keep as few dependencies as possible. MTT satisfies my requisition. The files it creates are only text files. They contain information where the templates were installed. Perfect. If MTT ever dies, I’d have to open the .mtt with TextEdit and install everything manually. More hassle, but I could do it without it. I can also just create these installers by myself, albeit less convenient. Motion Template Tool also has the ability to add version numbers to templates. Designs aren’t made of stone. They change constantly. Therefore versioning these files actually makes a lot of sense to me. Since I work with developers, using a VCS seems like a natural pick. It’s surprising that only a few motion designers actually do this. Ripple Training does not just produce some of the best Final Cut Pro X tutorials. They also recently started creating their own plugin, Callouts. The good thing is they work together with Noise Industries, so the plugin comes as option in FxFactory. FxFactory are officially endorsed by Apple to distribute “plugins”. Most plugins are Motion templates now. That’s how powerful this integration is. This one’s obvious. It translates Final Cut Pro 7 projects into Final Cut Pro X XML for import. Only basic edits are kept though, because it’s not possible for 7toX to translate more complicated transition effects into the new format. If you want to go the other way round, then there’s Xto7 – coincidentally by the same company. I’m actually not trying to up-convert old projects. Some time ago I’ve decided to keep an older computer for this purpose. A backup machine if my machine suddenly dies and to keep older software running. I’ll probably also use some virtualization software to have an older OS installation somewhere. Markers is another third-party app that solves a convenience problem. 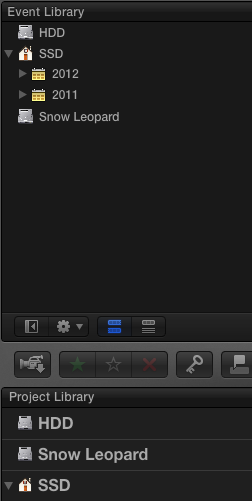 Final Cut Pro X can’t export marker lists anymore, so that one can make movies with chapters easily. An exported FCPXML however, contains the marker information. I could go through the XML and read all the timecodes manually or I could use Markers. Again, if this thing dies, nothing is broken, it’s just less convenient. It’s been an interesting year. I kept moving back and forth between the two editors. When I opened Motion 5 for the first time, I fell in love with it. I occassionally set time aside on a weekend to learn the new tools. I became more and more comfortable with them. Now that I took the plunge, I can’t unlearn what I learned from actually using it in a production.